Firstly you should be aware that an OCSP Responder is known by various names such as a Validation Authority, Revocation Server, OCSP VA, OCSP Server, RFC 6960 Server, Real-time certificate status server, Validation Server, to name a few! It’s best to stick to either OCSP Responder or OCSP Server to avoid confusion, or for management purposes OCSP Validation Authority (or OCSP VA for short) is also a good choice. Interestingly Microsoft Windows systems now provide OCSP client support. There are good reasons for this. Downloading large CRLs (often 200KB to 20MB in size) to multiple end systems is a heavy duty activity. OCSP protocols make this a much lighter task, typically each request and response is around 4KB. 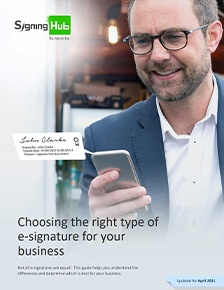 Embedding validating data into digital signatures is now becoming more commonplace and so embedding 4KB rather than say 200KB+ into a document signature is clearly very important. This is all we will say about OCSP clients, since the scope of this article is about the key features that you should check when deciding which OCSP Responder technology to use. These points are regardless of whether you look at open source or commercial products. RFC 6960 OCSP is not a complete panacea, it is important to note that CRLs have their place even if you deploy an OCSP responder. CRLs are essential for historical certificate validation services. OCSP VA servers allow you to have another channel for disseminating certificate status information and thus allowing you more flexibility on where and when to use CRLs. Newer protocols such as SCVP and XKMS and also OASIS DSS-X also offer historic validation and verification services. These are described elsewhere on the Ascertia web-site. How does the key management for the OCSP Responder work when responding on behalf of different CAs? Does it use the same certificate when responding for all CAs or can a separate certificate be used when responding for each CA? Obviously the use of separate OCSP response signing certificates with properly marked EKU (Extended Key Usage) extension is better for security reason – but not all OCSP Responders follow this approach. How about the use of separate OCSP response signing private keys for each CA? Of course for an OCSP Service Provider servicing multiple CAs belonging to separate organisations then this becomes pretty important – generally CAs will not want the same OCSP response signing key shared with other organisations, especially competitors! Does the OCSP Responder provide unique methods for receiving certificate revocation information from its CAs? E.g. is it configurable whether to use HTTP/S, LDAP/S or direct feed from CA database? Is it configurable on a per CA basis how often this information is retrieved by the OCSP Responder and how it should handle errors? Can the freshness of a CRL be checked as it is imported into the OCSP VA server? Can the CRL be checked and copied or re-published locally for disaster recovery purposes. 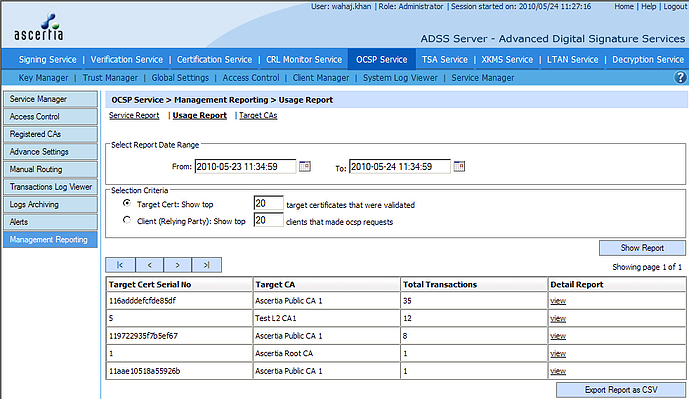 Does the OCSP Responder provide per CA transaction logging and management reporting? 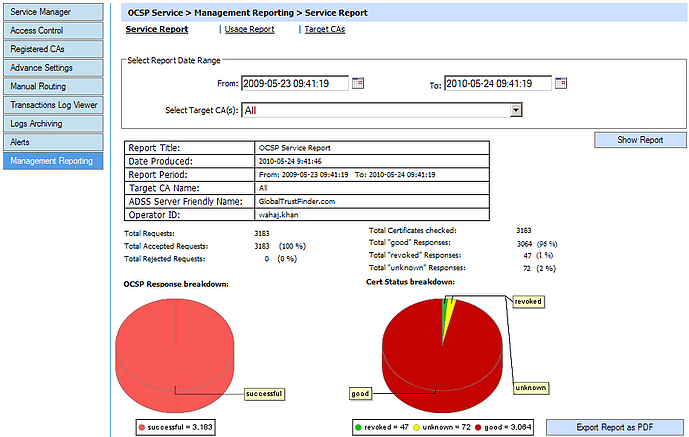 For example can the OCSP Responder produce graphical service usage reports on a per CA basis? Are the logs secured against change, deletion and insertion? 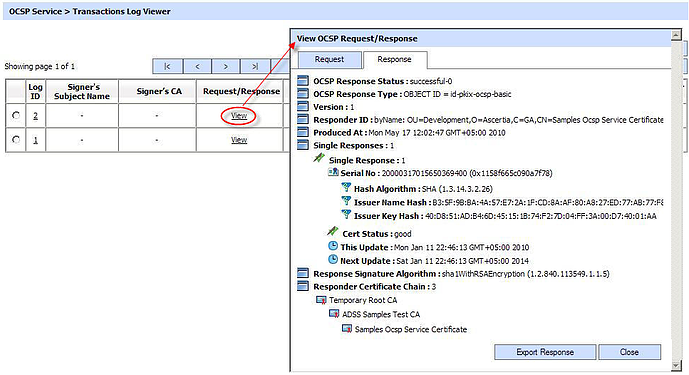 Can an operator explore the OCSP request / response data to review in English the key information to quickly and easily determine the cause of an error seen by an OCSP client? From experience without this each reported problem can take hours of senior technical person’s time to resolve. Cryptographic algorithms are continually weakening as the computing power available per dollar grows and as a result of continued cryptanalysis effort by the crypto community. It is therefore essential that your OCSP Responder is capable of meeting future challenges. As a minimum it means that the OCSP Responder provides flexibility when generating keys. The current norm is 1024-bit RSA keys but a move to 2048-bit is already underway. 4096-bit RSA keys should also be supported for future needs. ECDSA is not well supported at this time, but the supplier should be able to commit to support this if required. Another important aspect with regards to key management is the principle of “key separation”. Your OCSP Responder must be capable of using separate crypto keys for separate functions, e.g. OCSP response signing, OCSP request signing (when relaying OCSP requests), SSL Server key (when it is acting as the SSL server to OCSP clients), SSL client key (when it is acting as an SSL client to a back-end OCSP Responder which communicates over SSL). Of course there are a range of other key purposes also, like log signing, operator authentication etc. Each key should be managed with its own policy. Some organisations prefer their OCSP Responder certificate to have a short lifetime, this helps to ensure that any potential compromise of the OCSP Responder will be short lived, and also as a result allows the OCSP Responder’s own certificate to be implicitly trusted, i.e. it has a “no check” extension. This has an advantage since checking the OCSP Responder’s certificate can become difficult for relying parties as generally it means they have to use CRLs. However if you want to use short-lived OCSP Responder certificates then ensure your OCSP Responder supports automated re-certification from your chosen CA as it will become a major burden if you were to manually re-certify the OCSP Responder on a weekly or daily or even hourly basis! With regards to algorithm agility the main focus of the crypto community is currently on the hash algorithms that are used in the OCSP response signing process. SHA-1 has been used in the vast majority of implementations but it is now recommended by FIPS that it is no longer used. It is important that your OCSP Responder supports the new SHA-2 set of algorithms (this includes SHA-256, SHA-384 and SHA-512). Does the OCSP Responder have a scalable architecture to take advantage of multiple CPUs and can multiple servers work together as a single managed system behind network load-balancers (you will not want to manage individual OCSP VAs!). What is the speed at which CRL s can be checked and processed within the OCSP Responder? When CRLs sizes are in excess of 1MB, then the in memory processing of the CRL can become an issue. Check if your OCSP Responder can handle large CRLs using CRL streaming techniques. Ensuring high availability for an OCSP Responder requires the use of multiple instances of an OCSP Responder working behind a network load-balancer so that if one server fails the overall OCSP service is not impacted. Can multiple instances be operated at different sites to ensure a disaster at one site does not take the OCSP service down? It is important to ensure that all components of the OCSP service are also replicated, such as databases and also HSMs. Also note that if keys and certificates cannot be copied then the OCSP Responder needs to support the automatic use of alternate keys and certificates per server. 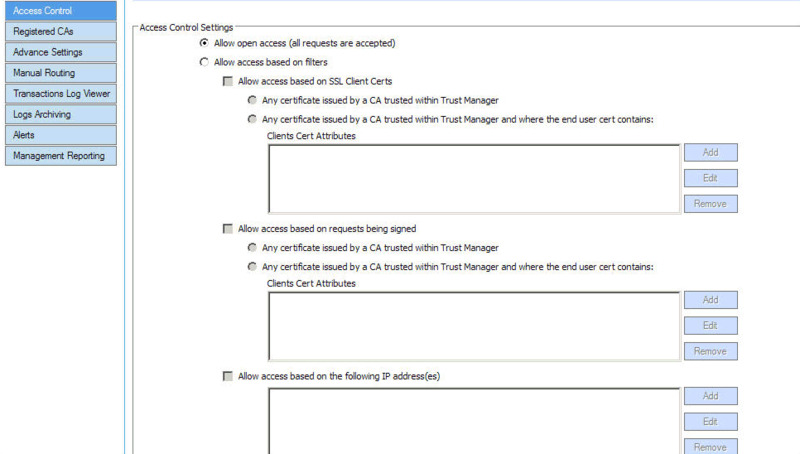 When using multiple OCSP Responder instances then only one OCSP VA Server instance will download the CA CRLs containing the latest certificate status information. It is critical that this is not a single point failure. If an OCSP server fails then another OCSP server instance in the high availability group must automatically take over this CRL management process. ADSS OCSP Server handles this using automated watch-dog process using master and slave servers to poll for CRLs. Were the OCSP requests signed and was client authentication performed by the OCSP Responder. Strong authentication of administrators together with role-based access controls for all system services. Some operators may be authorised to just review (on a read only basis) the transaction logs so they can help customers. Some operators will be authorised to make changes to the OCSP Service or the trusted CAs or the validation policy details. Secure and detailed transaction logging is an absolute must for an OCSP Responder. Not only is this needed for commercial OCSP service providers which want to charge for the OCSP service but the ability to review OCSP transactions is essential to resolve helpdesk issues quickly. A transaction viewer should be provided that can show all fields within each and every OCSP request and response. This must be present in human readable form that enables you to drill down to the details. It should be possible to export and import individual OCSP transactions or a set of transactions in case of disputes. Detailed operator logs and system event logs must also be maintained to know exactly what was changed on the system, at what date and time and by whom. To make all this logging effective the OCSP Responder must provide a flexible search facility across all its logs, otherwise the volume of data can obfuscate the information you need. System integrity is crucial for an OCSP VA trust authority. The server should protect all its configurations and transaction, operator and system log records with strong cryptographic checksums ideally using SHA-2 algorithms. Checking the system integrity should be automated, checking the system off-peak times since this can be an intensive operation. Manual checks should also be allowed. Detailed system integrity reports should be produced to ensure that nothing is overlooked. Generally OCSP Responders in high-trust environments will be required to use a Hardware Security Module (HSM) to protect the signing and HMAC keys. PKCS#11 support ensures that the software should be able to work with variety of HSMs. There are many things that could potential effect the normal operation of an OCSP Responder. These range from network problems when retrieving CRLs from the registered CAs, to CRLs not being issued when they should have been, to keys approaching their expiry date to database communication problems. Real-time alerting for an OCSP Responder must be high on the feature list. Generally you should expect the OCSP Responder to provide more than one option for real-time alerting. 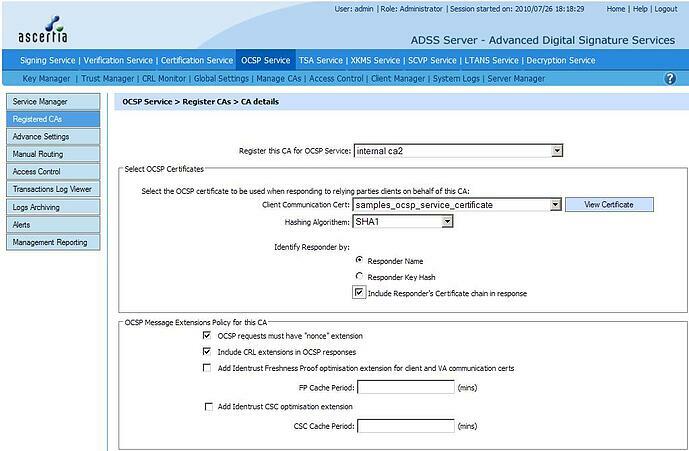 ADSS OCSP Server goes further and offers a choice of email, SMS and SNMP messaging. OCSP Client access control is an important consideration especially if you want to charge for your OCSP service. An OCSP Responder should be able to authenticate OCSP clients using a variety of techniques such as: OCSP request signing, SSL client authentication and IP address based authentication. The implementation should be flexible enough to set up rules that can include or exclude specific clients (for example exclude those users who are known to have abused the system but allowing others from the same group). Some customers need the highest levels of security and here the OCSP Responder must offer dual control functionality, i.e. where two operators are need to perform any change to the system, one operator performs the action whilst the second operator (usually security officer role holder) approves or rejects the action. The original change request should be held pending until reviewed and no action is implemented until approved by the security officer. Easy housekeeping and administration are important aspects of an effective security management system. Human interface complexities can lead to incorrect functioning or complete failure of the OCSP VA. An OCSP Responder should have a simple, secure web interface and policy-based engine that enables configurations to be made quickly and easily. Administrator actions such as system integrity checking and archiving of database records to prevent database bloating should be done automatically to avoid reliability issues. This information should be digestible in easy to understand manner using pie-charts and tables. 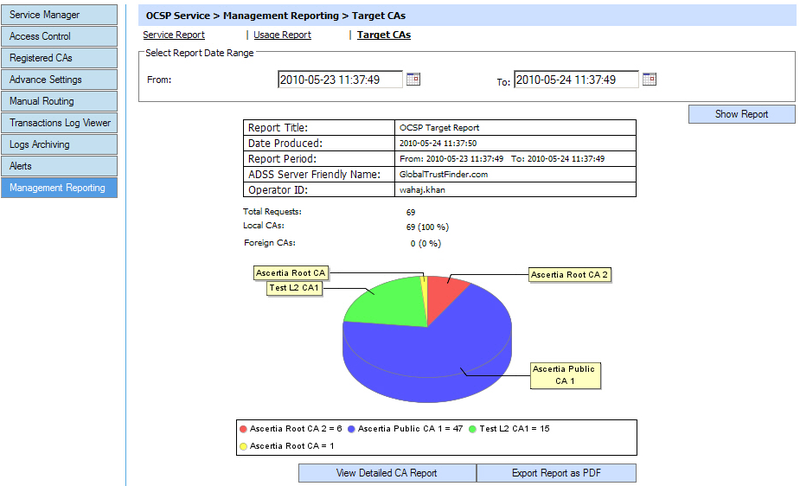 The management reports should be exportable in PDF and CSV formats so that they can be imported into Adobe® Reader and Microsoft Excel for example. Commercial issues have a high priority, with sensible OCSP server pricing being highest on the list. Occasionally you may find per OCSP transaction or usage limit charges, which can really push up the pricing for an OCSP server in the long term. Generally it should only be server-based pricing and per-user pricing, with options for unlimited users also. Test and pre-production test OCSP servers should generally low or zero license price. Competent suppliers should also be able to provide the necessary OCSP test tools that measure OCSP performance as well as OCSP service monitoring tools. 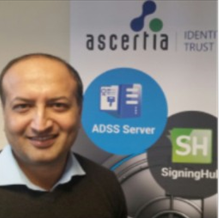 Finally before making an investment in OCSP Responder technology check whether the vendor has the right long-term strategy for certificate validation - are they investing in future protocols such as XKMS, SCVP and OASIS DSS certification validation? Can the product be easily enhanced to support these future certificate validation protocols today on the same platform, at low cost? This article describes some of the high-level must have features for an OCSP Responder. Naturally Ascertia ADSS OCSP Server scores very highly against all these points.